Brief Synopsis – A reporter uncovers information about a 30 year old murder by a group known as The Weathermen which causes a number of it’s former members in hiding to resurface. My Take on it – When I saw the cast of this Robert Redford directed film, I was amazed; Redford, Susan Sarandon, Julie Cristie, Brenden Gleeson, Terrance Howard, Stanley Tucci, Shia LeBeouf, Nick Nolte, Chris Cooper, Richard Jenkins, Anna Kendrick, Sam Elliott, Stephen Root. 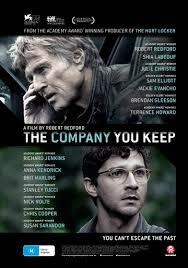 How the hell did Redford convince 8 other Oscar nominees (plus himself) which included 4 winners to be a part of this story? I’ll tell you how, because it’s a very compelling and interesting story. It tries to answer a basic question; will we see the world and our lives in the same way now as we will in 30 year? The answer is simple for some of us, but in reality, we all will react differently as do the characters in this story. I have enjoyed a number of Redford’s previous movies that he’s directed (Ordinary People (1980), Quiz Show (1994) and The Legend of Bagger Vance (2000)), but all the rest, IMHO were mediocre. Redford returns to form here and really brings us into an enjoyable complex world where all the simple answers aren’t so simple anymore. Nothing to apologize about, and truthfully I can’t remember a damn thing about the movie anymore, it’s been too long! It’s so rare for me to make the time to rewatch movies these days, I always prioritize seeing the news ones that I’ll admit, it’s unlikely!